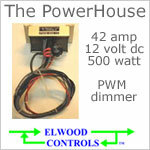 The eLw-pwm-500-12 provides a full 500 watts of 12 volt dimming or 12 volt motor speed control (DC voltage only). 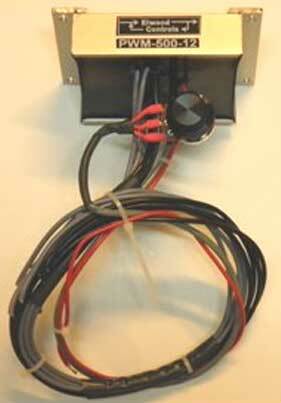 Up to ten, 50 watt, MR16 12 volt halogen lamps can be controlled with the linear sweep rotary control. The PWM (pulse width modulation) period has been optimized to eliminate halogen filament ring and LED flicker; and to minimize switching losses (promote efficiency). Thermal overload protection assures safe operation. The PWM-500-12 is fully potted for protection from the harshest environments. Great care was taken during product development of the optimized PWM period to eliminate halogen filament ringing, eliminate LED flicker and minimize switching losses to maximize efficiency. Lighting level is controlled with the included smooth sweep potentiometer. All drive electronics are completely encapsulated for uniform heat dissipation and environmental protection. Elwood Controls uses top quality extended range components that cost more than standard range components (the standard range = 0 to 70 deg. C). The Elwood Controls extended range is -40 to 105 deg. C for longer life.